We may never come to an agreement about this crucial issue, in fact, I’d wager that regional differences concerning the composition of smoked pork sandwiches would result in civil and international wars if we weren’t so busy blowing up brown people. I’ve been very busy in the Belm Utility Research Kitchen this week in preparation for the annual birthday dinner for She Who Must Be Obeyed, so I’ve been making simpler dinners with what’s available in the fridge. 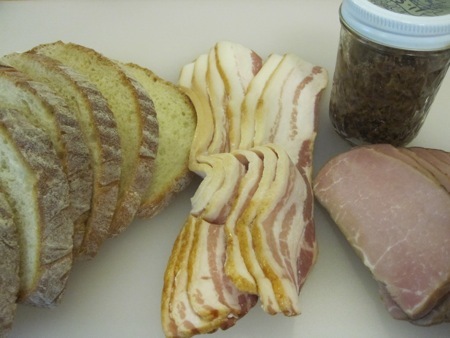 When I found a chunk of Canadian bacon and a few slices of homemade (i.e., streaky) bacon, I remembered last year’s triple-threat pork sandwiches and decided to upgrade the bacon sarnie by adding more bacon in the form of bacon-bourbon jam. 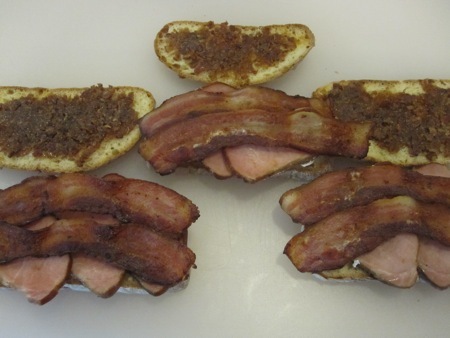 I toasted some country white bread, spread mayo on one slice and jam on the other, then layered Canadian bacon and crispy bacon slices. The jam has the same flavor profile as brown sauce – not too sweet, with onion and smoky notes – minus the gloppy wetness. I’d put this sandwich up against a bacon buttie any day (except the sarnie made at St. John, which I’m meant to understand is the Platonic ideal of bacon sandwiches). I only wish I had timed this meal to coincide with a wedding of some note that I heard took place in London.